VeryPDF PDF to Image Converter Command Line for Mac is an powerful and helpful application that can help you convert PDF to TIFF, JPEG, GIF, PNG, BMP, PCX, TGA, PBM, PGM, and PPM in Mac system. With this software, you also can convert password protected PDF to image. 1. Specify page range to convert selected PDF pages. 2. Able to convert open (user) password and permission (owner) password protected PDF. 3. Option to set image resolution, size, color depth of created image. 4. Option to dither image. 5. Support various compression methods for TIFF image. 6. 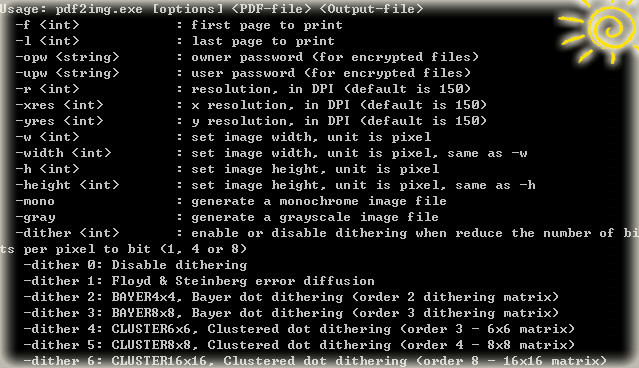 Option to convert multipage PDF to multipage TIFF image. 8. Option to rotate created image. 9. Option to automatically name newly created image files by customized naming rules. Statement: First, please download the orginal installation package by clicking the download link. Of course you may also download it from the publisher's website. Using PDF to Image Converter CMD for Mac crack, key, patch, serial number, registration code, keygen is illegal. The download file hosted at publisher website. We do not provide any download link points to Rapidshare, Hotfile, Depositfiles, Mediafire, Filefactory, etc. or obtained from file sharing programs such as Limewire, Kazaa, Imesh, Ares, BearShare, BitTorrent, WinMX etc. Software piracy is theft. If you like PDF to Image Converter CMD for Mac please buy it.